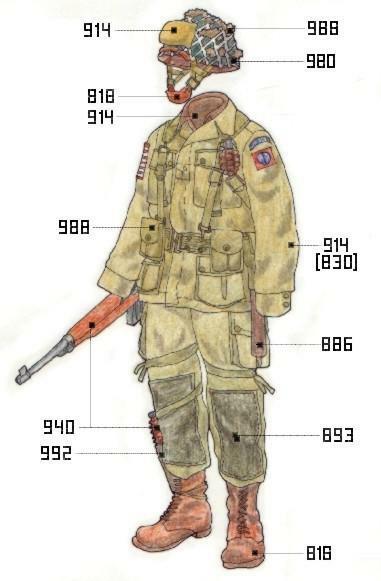 We have the idea that the US WW2 Army uniforms were all alike, with almost no variation. 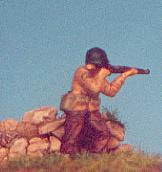 This is perhaps because of the primacy in modeling of topics related to the German army, leaving others in background. 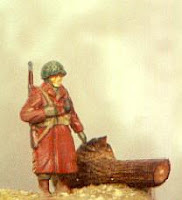 The examples presented here have been made ​​with the help mainly of illustrations in books or magazines on the US Army (WWII). 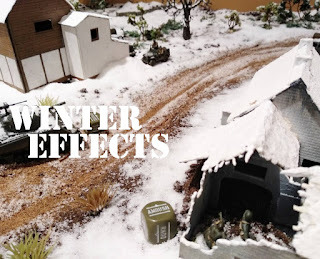 As for colors, I tried to select the most approximate, carrying out comparisons between the various options (color) brands, and other modelers, or publications related to the topic. 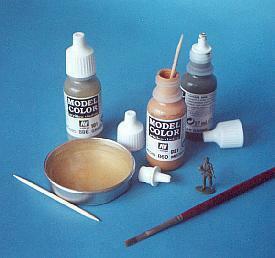 Here I used acrylic-vinyl brand colors Vallejo Model color. They are water-based colors with rapid drying and serve to metal or plastic. They come in 17ml containers and are neither toxic nor flammable. The indications equivalent to Humbrol and Revell colors are the most approximate, and in the case of not being able to determine equivalence, have indicated a second option (2). 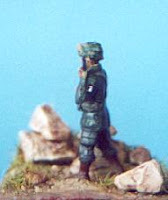 Keep in mind that colors have been chosen for the smaller scales, in this case 1:72. They are five brands: Matchbox ; Airfix ; Heller / Airfix ; Revell ; Hasegawa. From these figures half of them have been changed, some more, some a little less .. As I mentioned, I used acrylic and the good results that have contributed paintings are now my favorite, at least for the figures! For the faces and hands, I used the color 845 and once dry apply a wash, in this case with 874 color to enhance the shadows. The other colors correspond to the instructions given in this article painting. All the paints here are diluted with water or alcohol, and dried pretty fast. Also stressed that when we use the paintings for the first time, you should remove the paint in the bottle with a toothpick. The reason is that, as much as we shake the bottle, the paint stays at the bottom, and so it might be a little more dilute than what we expected . 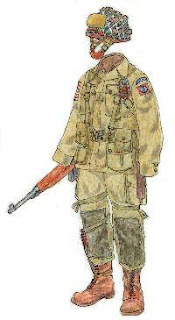 American uniforms had great influence on the military trends during the years following the end of the war, on almost every other army with their steel helmets and canvas equipment Both officers and sergeants all wore the same uniforms as the privates, and from a distance could only be distinguished by their individual weapon: whether it was a pistol, machine gun M3, one Thompson, or M1 carbine. 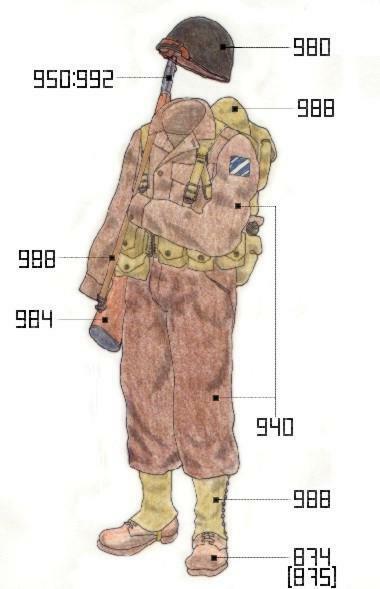 As a curiosity, because of the prestige of the paratrooper boots, the commander of the 82nd Division authorized the use of these boots for their soldiers. 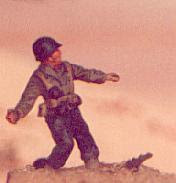 For that, it was only necessary to make a single parachute jump during training (not only did they have the right to use the paratrooper wings ). This did not please the 505 Airborne Infantry too much and in response, issued a notice that any paratrooper conducting a single glader landing was authorized to wear leggings & boots ! 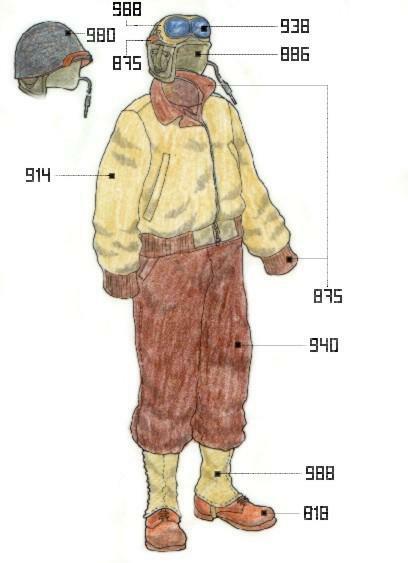 Jacket, like the first example, would be olive green. 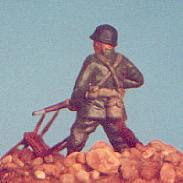 The American army used canvas with brass buckles painted black. 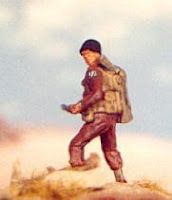 Thick canvas was cheaper and more durable than leather during the time of the campaign. 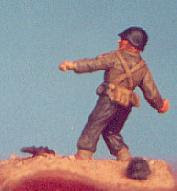 The belt had a metal rings to fix the cartridge, the canteen, bags and bayonet scabbard. Use the characteristics as a paratrooper boots, special for diving, strongly tied with laces up the shin to protect the ankle while landing on the ground. 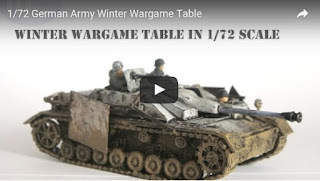 They were elite forces, they dropped behind enemy lines, charged with challenging missions, which had to resist until the arrival of the Allied forces (armored and infantry). 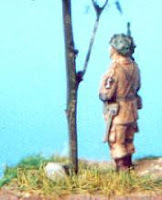 Among the paratroopers the usual place for the first aid kit was on the front of the helmet below the camouflage netting. 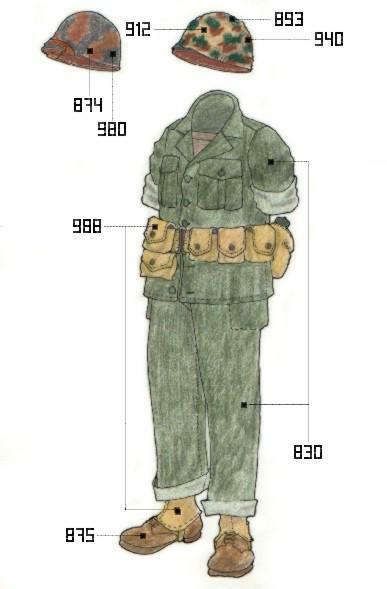 This uniform color, was used from 1942 and during the Normandy campaign, it became clear that it was not convenient for European forests and overnight subsequently it was replaced by the green uniform. 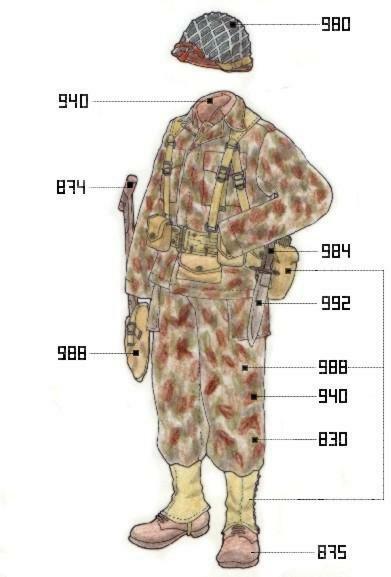 The Americans on D-Day also wore a camouflage uniform that was later abandoned to avoid confusion because they could be confused with the soldiers of the Waffen-SS who had a very similar uniform !! 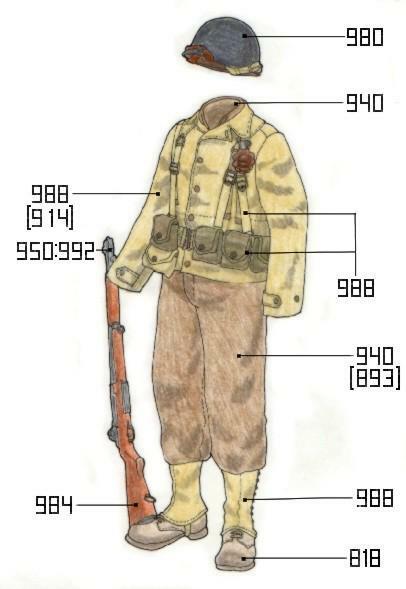 This uniform was not very frequent, mainly used by the Corps in the Pacific, one very similar was used by snipers, or in some special missions camouflage consisted of five colors:.. Base color, khaki brown, dotted with brown and green spots, and two lighter shades of the same brown and green. For these small scales, in my opinion the first three will be enough The helmet (M1) was usually covered by a net, avoiding reflected sunlight. 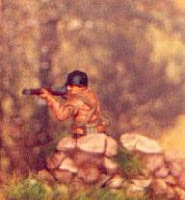 Outside the tank for additional protection it was possible to use an M1 helmet. 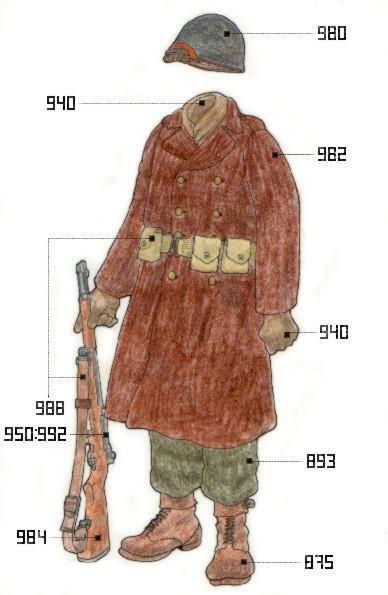 Other features of the garments of the armored divisions was a lined jacket with front zipper.It was very popular with the troops and everyone wanted one a design still in style in both military and civil fashion! 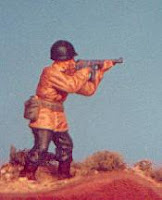 This is the wool coat of the US Army. With the arrival of winter, not everyone received the right clothes, so many had to improvise. 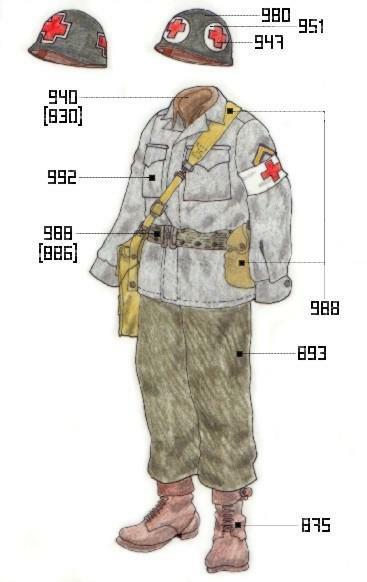 Before receiving white coats with a hoodfor camouflage in the snow, they took what they had at hand. Here are pieces of sheets. 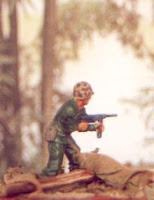 Additionally, some helmets and tanks, were painted white. When winter equipment was distributed, it also included some curious rubber soles (black) with an light edge to be placed on the outside boots the idea was to avoid direct contact with the frozen ground. Turning to the figures, I refer to one that has a white layer This sheet paper is divided into three parts. Two lower and one for the upper body.The paper I used is plain paper A4 sheets, and each piece was crumpled and rolled in hand to form a small ball, eliminating the stiffness of the paper. After unrolling, the pieces have sides cut to size and placed and glued individually. With a small knife the paper is fixed in place. 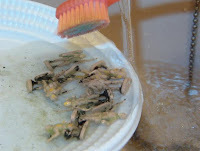 Finally to harden the paper it has been soaked in SuperGlue (cyanoacrylate). The doctor uses a waterproof jacket (1945). 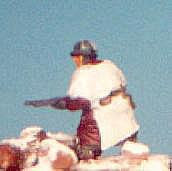 On helmets with netting, instead of a cross painted, some used a piece of white cloth, with the red cross placed in front. 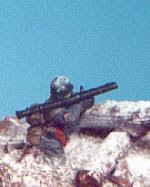 Marines wore a shirt that was different from those of the other forces. It had only one chest pocket, unwrapped and placed to the left side, where the Marine Corps insignia was printed in black. 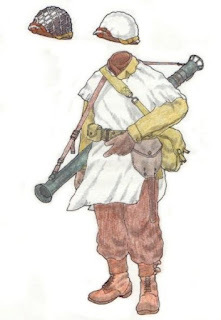 In this article I have tried to be as accurate as possible , both in the colors and descriptions of the drawings. That does not mean that there are no errors or other possible better options (in this case colors! ) And I am available to receive any correction and / or suggestions, mostly about colors.